Scotch is a big, beautiful bunny who looks like she’ll be so soft to pet. It’s no secret that I’m a big fan of Scotch, so how perfect to feature a beautiful rabbit with the name Scotch. 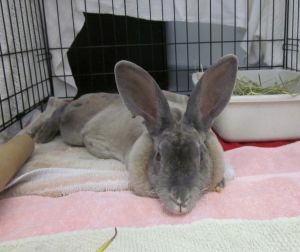 This big, loving bunny is up for adoption in Massachusetts. She was found as a hungry stray, but is now properly pampered and ready for her forever home. A lot of people think rabbits can live in the wild, but only wild rabbits have the knowledge to do so. Like all domesticated pets, rabbits need a loving home and people to care for them. Want to know more about caring for a house rabbit? Click here.